Shown (from left) are: DePaul president Mark Fuller; commissioner/CEO of NYS Homes and Community Renewal RuthAnne Visnauskas; Niagara County Department of Mental Health and Substance Abuse Services director Laura Kelemen; Lockport mayor Anne McCaffrey; NYS senator, District 62 Robert Ortt; assemblyman, 144th Assembly District Michael Norris; president Regions Affordable Housing Robert Chiles; and director of housing, New York State Office of Mental Health Brett Hebner. 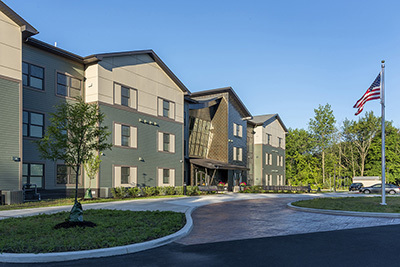 Lockport, NY DePaul Properties’ new $17.7 million Packet Boat Landing Apartments recently celebrated its grand opening. Named for the barges that stopped there during the Erie Canal’s heyday, Packet Boat Landing will help adults in need of supportive services live independently. The three-story, 62,000 s/f affordable housing development features 60 new one-bedroom units, along with management and support service offices, and lounges and laundry rooms on each level. The project also features a community room that opens to a courtyard with walking paths and a unique rain garden, which functions as the stormwater management system. SWBR designed the building with other sustainable materials and features, as well, including a rooftop photovoltaic system, with the goal of obtaining LEED for Homes certification for the project. SWBR also provided interior design and structural engineering for the project. Calamar Construction was the general contractor. The project received funding through NYS Housing Financing Agency, NYS Homes and Community Renewal subsidies, Low-Income Housing Tax Credits, NYS Office of Mental Health loans and grants, and a grant from New York State Energy Research and Development Authority. The project also received funding from NYSOMH for case management services.